Increasing your chances of ranking well on Google starts with finding the best keywords to target. The words in the title of your blog post, sub headings, in content of the post, and in the anchor text of links to your blog have a great importance in determining how you will be found through search engines. It’s quite possible that you are targeting the wrong keywords. If you want to be on the top spot with your blog and writing, you have to master the art of finding the right keywords to write about. So what is a keyword? Keyword is a word or a group of words that are being used by people to key in search engines when they are looking for something. Taking the time to properly research your keywords will help you to attract more traffic from search engines, leading to making more money, and will also help you to generate fresh content ideas. While keyword research does require some extra work, the results you get are very impressive if you take your time and put the right effort into it. The keywords can be classified in to two – long tail and short tail keywords. The term ‘long tail’ is used to describe the strategy of targeting less-competitive niches rather than the hugely competitive broad keywords. A long tail keyword is something like ‘Web Design in New York’ whiles a short wail keyword is something like ‘Web Design’. Short tail keywords are composed of one to two words while long tail keywords are short phrases composed of more than two words. Why you should focus on long tailed keywords? When you launch a brand new website in a competitive niche it will be very hard to rank for short tailed keywords. Your competitor’s may be in the market for years and have a huge amount of trust, tons of content and back links to their websites. You will likely to fall if you try to beat them right from the start for the most potent short keywords. For example if you are a Web design company based in Delhi, India and looking for targeting for the keyword ‘web design company’ you will have a hard time because even though keyword have got 368,000 searches globally, the competition is very high ad your chances of reaching top is limited. Now I you target a little broader keyword like ‘web design company india’ the number of searches is less, but your chance of getting top in the results is more because the competition is less than the case above. If you focus on more specific keyword like ‘web design company delhi’ even though the number of searches are very less, you can reach the first page of search results without much hard work. Another important thing is that the visitors you are getting from that keyword will be highly targeted, mostly belongs to the city where your company resides and hence your chance of converting the visitors in to customers is very high. If you are targeting longer keywords the competitiveness decreases and the potential of ranking increases. Research on the search behavior shows that the searchers are becoming more specific in their queries and using long tail keywords more as this saves their time. Google Instant has also given a boost to the long tail searches as the long tail keyword suggestions offered by Google when the searcher types the query is easy to select and search for. A keyword research tool tells you exactly what words and phrases people use in a search query and it tells the volume – relative popularity of keywords. Most keyword research tools need no downloads and can be accessed from any computer with an internet connection. There are plenty of keyword research tools available, but I recommend using the best and free one – Google Adwords Keyword Tool. The Adwords tool was designed for helping in PPC campaigns but it became a vital tool for keyword research. Google Adwords identifies the number of searches for specific words or key phrases. First you have to go to Adwords tool page. Then you have to type in the phrase you are going to research. Enter the security word (you will have to do this occasionally if your session times out). Click on “Get Keyword Ideas“. 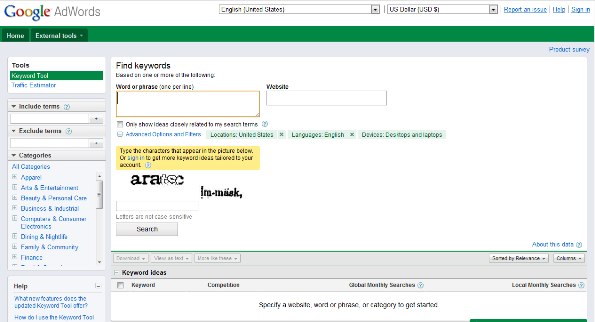 Alternatively you can type in the name of your competition website and you will get keyword ideas. This extremely useful if you are planning to spend money for Pay per Click campaigns, you will get an idea about the keywords your competitor is paying for. Now let us look how to use Google Adwords tool to form post titles that have potential to bring good search engine traffic. Let us consider an example of blog writing about android applications. They created a list of top android applications and named it as ‘Top Android Applications’. Now let us have a look on Adwords tool for the search volume of this keyword. It shows that the number of searches receiving for the keyword ‘top android applications’ is 301,000 which is very good. But have a deep look, in the keyword tool page there is something called keyword ideas. This will give you some clues to what to title your post and what keywords to use throughout your article. You can see that the keyword ‘best android applications’ get a search volume of 550,000 that is almost double of our first keyword ‘top android applications’. So you think, which will be our best bet? Should we name the article as ‘Top Android Applications’ or ‘Best android Applications’? Let us consider another case, you wrote a post about blogging mistakes and named it ‘10 Deadly Sins of Blogging’. But how many people do you think will enter the term ‘deadly sins of blogging’ while searching? At the same time if you named that article ’10 Blogging Mistakes You Should Avoid’ then you have a higher chance of coming top in search results. So now you are in confusion, you have to leave a cool headline in order to attract search engine visitors. If you are a WordPress user then you are very fortunate to have a solution for this problem. Most of you may be already using the All in One SEO plugin. All In One SEO Pack allows you to tweak the post title independent of what is actually being displayed in the blog. This way you can have a nice attention grabbing title for your blog readers and a long keyword rich title for Google. This is very helpful because usually attention grabbing headlines get higher click rate in social media sites where as the keyword rich titles perform well in search engines. Are you too busy to do keyword research? Keyword research is a process that you can’t avoid, but are you too busy to do it? Then there is a useful tool that will save your time. Keyword Winner is an excellent WordPress plugin which will research keywords for your blog posts easily. You will get targeted, highly searched, non-competitive key phrases for every post using the Keyword Winner WP plugin. When you type to create a headline in your blog post, the results automatically display making it easier for you to get instant information so that you can choose the best headline based on its competitive nature and search trend each time. The plugin will cost you $47, but if you are a person who values time more than money you will find this plugin extremely useful. Do you spend time for keyword research? Do you think it is important? What are the tools you use for keyword research? Let us discuss in comments. not busy too do research the keyword… but no idea…hehe… thanks for the tool.. i already know.. but not really know to optimize this tool..
You can learn keyword research very easily Zik. It will help you a lot. Thanks Paras, you have to start with Keyword research, it will be very helpful. Well I m using google adword keyword tool which is awesome, after using it I am getting visitors mostly from search engines btw I m not using keyword winner after your short review about KW i m going to give a try. Keyword Winner will make your life easy. Even though it is actually using the details in Google keyword tool & Google trends it saves a lot of our time. Time is the money, isn’t it? Optimizing for long tail can have huge traffic benefits. The trick is to identify bunch of long tail keywords and try to rank for most of these keywords. Cumulative effect will definitely help in ranking for the main keyword as well. That is correct, if we are able to get good traffic for our long tail keywords, it will also boost our rankings for our main keyword. Thanks for stopping by and dropping a comment Nishadha. I have a similar video on Google keyword research Tool. It seems as you have just written everything i have in my mind. Thanks rojish. Thanks for the comment Rakesh. Great stuff! I love the ‘competition’ icon. That is a great feature. Thanks for the share Rojish, I also use the keyword tool to find appropriate keywords for my posts. Good article. Choosing your keywords depends on the competitiveness of the niche you have selected. If it’s a highly competitive one, a long tailed keyword is definitely the better choice but if it’s not that sought after, a short tail keyword will not be a bad choice. Targeting short tail keywords in a non competitive niche is good, even though finding such a niche is very hard. In most niches the best bet is to start with a long tail keyword. Thanks for your response buddy. Have a great day! I agree, finding a niche where a short tail keyword is quite difficult and have experienced this myself. I think I will try switching over to long tail keyword soon to see how it goes. When you go for long tail keyword the main target is to reduce the competition. Even if you have a short tail keyword and the competition is less you can go for it. What’s your primary keyword. I do, I try to spend a few hours a week focusing on it. I think it’s important, but I believe social might change SEO a bit. I like using the GKT and the Wordtracker tool. You are right buddy, social media already started influencing SEO. In near future it is expected that the influence of social media in the search results will be larger. I am using Wordtracker too, and it is also a good tool although it isn’t free. Nice Post Rojish. I have always neglected keyword research and only focused on Real Content. But your Post now motivates me to Do the keyword Research for the every post that I write. Thanks for your response Harry. Thanks for sharing the best tips on keyword research.. this one is definitely worth for a bookmark.. Thanks for the comment Raj. I’ve switched to a keyword tool included in SEO Powersuite and haven’t looked back. Thanks for the comment Barry, have a great day! nice article Rojish! i spend a great deal of time doing keyword research, i think it’s the most important thing to do before buying a new domain and creating a website. what i like to do also, is to check the first page of google competition for that particular keyword. Hello Marcus, welcome to my blog and thanks for dropping a comment. You are right, spending some time in Keyword research will help us a lot in our blogging success, researching keywords before buying the domain is very crucial. Keyword research is very essential when it comes to basic SEO. I normally do keyword research using Google Adwords keyword tool because it is free and easy to use. I also have tried All-in-One SEO plugin which is very helpful as well. Keyword Winner WP plugin is, I think, is a great paid plugin, but of course, not all are ready to spend $47 for it 🙂 Thanks for sharing! Keyword research is a very important part for online success. We should always research something before starting a website. Nice tool ….thanks rojish for sharing such a nice information…. Thanks for taking time to put all this together. It will help a lot for people new in SEO. Keyword research is the first and foremost step of any SEO campaign. Google adwords keyword tool is very effective. Keyword Winner is a nice find. I would like to know do they provide free trial for it? I do keyword research as part of my blogging and content strategy in order to write the answers to questions people are looking for. This has directly brought me business and as such is a great success. thanks, this is really helpful. I realise now that I’d been focusing too much on short-tailed keywords instead of the long ones so I’ll keep your ideas in mind in the future! Understanding then applying the proper usage of Keywords is of great importance. Deciding on which Keyword terms to target, can take quite a bit of time as far as refining your choices. Some very high quality, high traffic terms are very competitive. Reaching page one(Even the bottom of page one) for these terms, would be a great achievement. This is where you will see the more established(Known brand) Blogs(sites). First time here (came across you on Stumble) and love it! Just tweeted and Google+ it because at last you’ve made clear how keywords and SEO actually work! Never knew about the long and short tail…now I know! Thanks! Hello Claude, welcome to my blog. Glad to know that you found my article useful. I am very new to SEO and just learned so much from this post. I was using the Google keyword tool and it wasn’t working in my favor. I was chasing short tail keywords in a very popular niche outfit. Now I will focus on longtail keywords and will let you know how it goes. Very informative post, thankyou Rojish! Keyword research serves the integral part of blogging. Long tail keywords provide useful insight in narrowing down the competition, but, I frequently prefer short tail keywords too, as they have huge traffic volumes and can work wonders even if you luckily get yourself on Google first page. Hi, Rojish! I purchased Market Samurai for this purpose, but I’m still getting my head around it, as I’m a newbie. It seems like a good tool, though. Congratulations on a very well written and informative article. The tip about having one blog title for the search engines and another for human readers is especially good. I would like to say that the success of entrepreneur’s online business depends on keywords selected. On the one hand, it is necessary to select good keywords which can drive high ammounts of traffic to an online resource. On the other hand, we should take into account the competition of keywords, because it can take a lot of time and work to achieve SEO improvement for highly competitive key phrases. I don’t really spend time focused on keywords at all. But lately I have started to notice huge country specific results (getting huge traffic from one country for one site, and another country from another site). In your example, if the customer base is world-wide this local effect doesn’t matter. But if the business was targeting local customers I wonder if it might be possible to do well (even with globally very competitive keywords). I have noticed small localization effects over the years, but recently it has been many many times as great (it might just be special things related to a few of my sights, I am not sure. This has been one of my favorite articles I came across!! Well, really nice idea to post about Keywords and Keyword research!! Nice explanation, great work and nice blog!! hello rojish , i’m planning to start a micro niche blog .. hope keyword research is helps me to get success in micro niche career . wow nice blog rojish. Yes i think that is correct, good keyword will boost our search rankings. Keyword research is really important on Affiliate marketing. As i encounter in our company, we really need that to increase page rank and traffics. It is very important to find the right keywords. If they are not accurate Google will think that they are spam and misleading and it could cause problems.. It is really a must to find a perfect keyword. Keyword is one of the important thing to consider especially when you are a SEO. Great post by the way! Rojish, good and very useful article but on your recommendation I purchased Keyword Winner – I have to say it is one of the poorest keyword research tools I have used – the options are great on the tool itself but the results are total junk. I’ll stick to using the adwords tool. Thanks rojish. this article is very helpful. i am just a newbie in the world of SEO. However looking at the efforts, i am just wondering whether running a blog makes business sense. Thanks Rojish for the informative article. It is really a great tutorial for Keyword research.